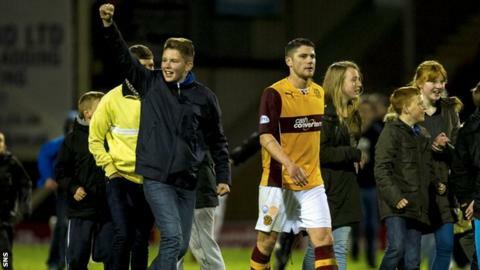 Motherwell boss Stuart McCall could not hide his delight after his side defeated Inverness 2-1 to take the battle for second place to the wire. John Sutton's penalty and Gary Warren's own goal gave the Fir Park men a somewhat fortunate lead. Inverness threw everything at them after that, but the Steelmen clung on to move within a point of Aberdeen. "I'm so proud of the effort," McCall told BBC Radio Scotland. "We weren't the greatest, but we got there." Motherwell now travel to face Aberdeen at Pittodrie on Sunday, when victory would see them finish best of the rest for the second season in a row. It was almost snatched from them, though, when Billy McKay's shot three minutes into injury time hit the inside of the post. "It's incredible," said the Motherwell manager. "We got a little bit of luck at the last kick of the ball, which we needed. "I can go back to three weeks ago to that same goalmouth when Kilmarnock, with the last kick of the game, their shot hit a bobble and went over Gunnar Nielsen. "You're thinking 'it's just not meant to be this year' and yet McKay hits the inside of the post. "I said before the game they'll have a lot of possession because that's the way Inverness are playing at the minute. We had some decent chances, but the bottom line was we had to do anything we could to win the game. "We've got three points and that's all that mattered tonight. The lads and the supporters for their efforts this season deserve to take it to the last game. "I'm just so pleased and happy for everyone connected to the club because it's been a struggle at times. "Also we can't forget we've played some really good stuff to score the goals we have. If you look at the goals-for column, it's fantastic." There was a war of words between Well defender Stephen McManus and midfielder Iain Vigurs during the game, but McCall defended the confrontation. "I've been there," he admitted. "Elland Road, Bradford City. Getting beat 6-1 me and Andy Myers, and worse than that, I ended up with a cut. It was just passion. "What they were saying, they were both right in a way. But I can't be angry with that. They wanted it so badly. "They're both in there kissing and cuddling in the shower."